This is an absolutely gorgeous ring! Very unique, I always get compliments whenever I wear it. This unique contemporary engagement ring from the Miadora Collection. Features a round-cut black diamond center stone with two round black diamonds bezel set at the front and back. The band features exceptional ribbed scalloped and marquise design art work, pave set throughout with a total of 22 round black diamonds. What a great way to remind your special someone they stand out from the day to day. All weights and measurements are approximate and may vary slightly from the listed information. *total diamond weight is approximate. 1 1/4 carats T.W. may be 1.22 to 1.28 carats. Treatment code G. See Treatment Guide for further information. This item is part of the Miadora Wedding Collection. If you are looking at this for an engagement ring I highly recommend it! Look, there are so many women sporting the same clear (glass looking) diamonds and CZ. Be bold, different and really catch the attention with this black stone! I knew I wanted something different but I had girlfriends who questioned the black and I explained it like this. This ring being black represents no end - infinity and depth. When you look into a real "normal" overly expensive diamond you can see the ring underneath. Those rings are shallow, common, and plain. My soul mate and love has none of those characteristics. This ring perfectly describes the depth, intensity, uniqueness, and vintage respect we have for each other. I could never be happier! This ring is remarkable!! This is a true eye catcher. It has received numerous wonderful compliments however, my daughter got this as an engagement ring and cannot wear it due to the prongs not being cut correctly and holding the stone in place. It has been hard to find anyone willing to correct the problem and add additional prongs to the stone with the setting being so unique and we are worried that she has a lovely ring that will be in the box forever. Don't expect that you are getting more than you are paying for appraised value is around $$$ as the center stone is very poorly cut with dimensions that are far less than perfect. All in all though this ring is BEAUTIFUL and perfect for those not wanting to go the traditional route. DON'T RUSH TO BUY...SHE GOT HERS IN JULY (purchased in June I think) AND THEY STILL HAVE THEM!! Everything is great with the ring except two things: the white gold has worn off a bit on palm side of the ring after only a month and the two small black diamonds below the 1 carat black diamond don't really match the rest of the ring in terms of how it is set and how it has a circle setting to keep the diamonds in. We purchased the 3 year protection plan and I definitely will be taking advantage of it for the wear and tear I expect will occur. I do wish a band from Miadora existed that was made to pair with it. It would make a great wedding set. The ring is beautiful. I got married in October and lost my wedding band in January. I had created my own wedding band with black diamonds that cost over $1500. My quest for a cheaper replacement began (since still paying for last wedding rings). I love the detail and the black diamond is big and gorgeous. I am able to see a small flaw inside the diamond but someone would have to be really studying it to notice. I believe that for the price, it is worth the it. I did a lot of research, specially after the bad reviews, on black diamonds. Black diamonds are difficult to cut and to come out perfect so take that into consideration before you purchase black diamonds. I love my ring! I will add white gold enhancers to finish off my wedding ring. Many compliments already and I just received it. My husband bought me this ring to replace the wedding ring that literally slipped off my hand in a haunted house in 2009. It was his gift to me for our 5 year wedding anniversary and I could not be more pleased. The small details that are not seen in the images online are outstanding. It looks so genuinely vintage, I can hardly believe its a new ring. My particular ring has no prong problems that I can see or feel so far. I will say that the center stone's color is not as black as I thought it would be. It almost appears gray and cloudy in some lights and then in others it has a metallic appearance to it. I am no expect on diamonds, much less black diamonds, but I was expecting a solid back stone. With that being said, the stone is actually beautiful and unique despite catching me off guard at first. Over all, the ring is classic and elegant. 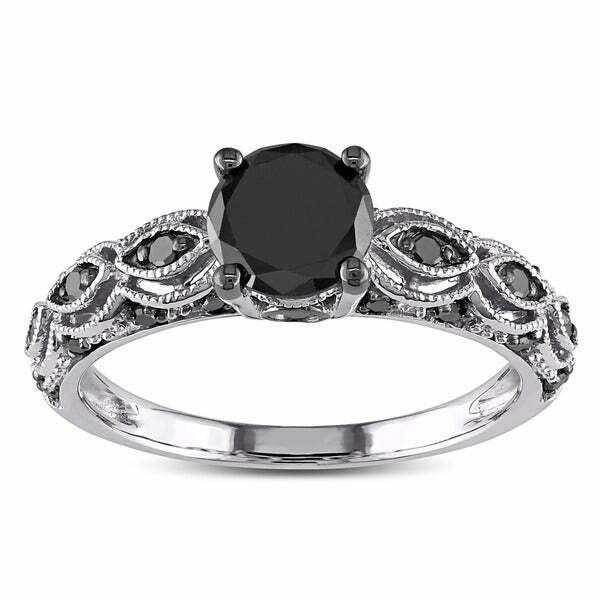 I loved my original ring and miss it very much, but this vintage style black ring is actually much more our style. I have had it less than 24 hours and have gotten compliments from everyone I have come in contact with. It goes beautifully with my white diamond wedding band as well. Bottom line, the ring is beautiful. A solid choice for a couple who is looking for something more than your standard white diamond. I am completely in love with it and can't imagine wearing a plain white diamond ring fir my wedding ring anymore. Again, the small details on the band are what I love the most. Quality piece for an amazing price! She will love this ring. My bride to be loved this ring and so do I. The diamond and the accents are exactly as shown in the pictures. For the price you will not be disappointed. I wanted a white diamond for the center stone but did not find one with the same accents. I proposed to her under a full moon with the stars shinning bright. Now she and I will remember that beautiful night forever with the help of this ring. I was looking for the perfect wedding ring for me, after getting married with just a band. I am not traditional and hated the over-the-top sparkle of traditional rings and clear diamonds. My favorite stone is garnet, because of the color, but that seemed too casual for a wedding ring (and I have had many over the years as my commitment rings). So I decided to start my REAL jewelry collection with black diamonds. After searching several sites that carried them, this one had the best look to me: vintage, yet unique. I wasn't too sold on the round diamond, but ended up loving it. I stare at it multiple times a day and just love it! I am very happy with my purchase. And a great price too! Shipped within days! Ring was perfect!! I was looking for a not so average engagement ring and that's exactly what I got! The black diamonds sparkle and the detail to the ring is far better in person than what can be seen by these pictures. I get tons of compliments on my ring. It's been 4 yrs since we purchased my ring, and people are still impressed by how different it looks from the details down to the black diamonds.The center diamond may not be a huge 2 or 3 ct diamond but the uniqueness in this ring alone calls its own attention. That's probably what I love most about it. Some women are solely focused on the size of their diamond just to make sure it leaves a great impression on others. I love that the center diamond is only 1 ct, but this ring gets a lot of attention as if it were bigger. I remember having a client with a huge white gold white diamond ring gushing over mine. I was like " your ring is huge and beautiful though". Her response was although her ring was huge a beautiful it was now a standard ring that you'll see on the finger of many women. She said mine however is not a ring you see everyday and that she would cherish a ring like that more than her own. That to me says a lot and made me appreciate my ring that much more. I had been looking on several different websites for an engagement ring that was in our price range and that I could picture myself wearing the rest of my life. Eventually all the white diamond rings looked the same and I couldn't decide on any. Then I saw this one. At first I wasn't sure about getting a black ring, but it's absolutely gorgeous. Even though its a black diamond ring, it still sparkles. The picture on this site doesn't do the ring justice, its gorgeous. It is unique, and definitely suits my personality. My girlfriend loved this ring. It is very beautiful and is very unique and not the run of the mill ring. The main diamond on this ring had 3-4 scratches and dings. It was a mess. Your "gemologist" played it off as inclusions rising to the surface that only "look like" scratches and dings. I would've returned the ring altogether, but I love the setting. Luckily, I'm in Afghanistan where black diamonds are reasonable, so I had to pay an extra dollar amount to replace the stone. I personally feel ripped off for paying $$$ to you and then having to pay an additional fee to replace the stone. So, that's my review. I probably will not buy anything from your company again. SGT Lynn S.
Order arrived a day ahead of schedule and in the condition I expected except for a slight polish job that I had to do myself before proposing to my girlfriend. She loves it and naturally said Yes. STUNNING! BEAUTIFUL! It was more than I expected. This ring is definitely a piece of jewelry to be kept as a family heirloom. when my ring arrived it was chipped on the sides i called customer service and they sent me a new one which arrived in 2 days, the ring is stunning, cutomer service was great, they handled my situation very quickly. This is a very pretty ring, and not as an engagement ring. I bought it for myself. Rich looking. The side trim and stones really dress it up. I feel the price is suitable for this rich looking ring. Nice solid black stones. Most beautiful and unique ring I've ever owned! Glad this is my forever ring! The problem with this ring was that it had a flaw on the main diamond. There was a sort of discoloration that was highly noticeable. I hated to return it because I love the vintage look of it. Hopefully, the next ring I order will be flawless. Wife loves it. The ring i got looks just like the picture. You can't go wrong with this ring especially at this price. I have spent a lot more on other rings, this one blows the others away. My marriage was dark, just like this diamond ring. She loved it and the fit was perfect. "Do you offer a longer warranty the the 3 year?" No, the 3 years is the maximum we have. "What band would work with this? ITEM# 15565222 or #13291595 or #13291595? Or would something else work better? Thanks!" "I ordered this ring last September,it turned yellow, is there anything I can do about it? " "Do they offer this ring style with a blue center stone?" I like antique style rings. This was the design I liked best. "Does the Platinum Protection Plan cover rhodium plating for this ring as part of normal wear and tear?" I've worn the ring about 18 months and had no issue with tarnish BUT an entire marquis shaped section fell out! Not a stone coming loose but an entire design element is lost! The ring is GLUED together, not soldiered! Buyer beware! Purchase the extended warranty or be on your own for repairs, as I am now. "In regards to "non conflict" diamonds, where does Miadora purchase their diamonds? And Where can I read about their specific purchasing process?" Hi lolaloveslife, we were able to verify this information with our support team. Overstock.com actively supports the United Nation's Kimberley Process Certification Scheme to help eliminate the sale of conflict diamonds and guarantees that all diamonds offered for sale on our site have been purchased from recognized, legitimate sources in compliance with all United Nations Resolutions and, to the best of our knowledge and ability, none of our diamonds fund any terrorist activity. Overstock.com makes this assurance based on personal knowledge or written guarantees provided by our diamond suppliers. If you would like to do more research please look up the Kimberly process online for more information. Thanks for shopping with us.